Between the thousands of articles, books and films, both factual and fictionalised, that have been made about the Richard Nixon's presidency and the Watergate scandal, the subject has been so thoroughly gone over that it would take something very special to offer any new insight into that turbulent period. While Penny Lane's Our Nixon doesn't offer any startling revelations or interpretations on Nixon's actions as President, it at the very least offers a novel perspective on them. Constructed primarily from home movie footage shot by John Erlichman, H.R. Haldeman and Dwight Chapin, three of Nixon's closest aides and key figures in the Watergate cover-up, Our Nixon provides a unique glimpse into life in the Nixon White House, one that contrasts the creeping paranoia at its heart with the sunny, happy images the men captured. It might be a very simple thing, but seeing Nixon and his staff smiling, laughing and joking around is very jarring, at least in terms of what Nixon has come to represent in the broader culture. The Nixon that most people know is a dark, twisted figure who was plagued by visions of enemies both real and imagined, and who used the presidency to wage a secret war on those who were not part of his "Silent Majority." He saw the fissures in American society and exploited them for his own ends, creating deep cultural divisions which persist to this day. His name has become synonymous with the abuse of power, to the extent that everything else he achieved during his five and a half years in power has been completely overshadowed by the scandal that ended his term. He's become a caricature of corruption, rather than an actual human being. To see this man, this American Richard III, as someone who could crack a joke and mess around with the people he worked with is an altogether more sympathetic representation than we're used to, and much of Our Nixon is devoted to interviews of Ehrlichman, Haldeman and Chapin talking about that aspect of their time in the Administration. It's a much more intimate depiction of the 37th President, and while it does little to dispel the idea that he was a Machiavellian schemer - the use of recordings from within the Oval Office to illustrate Nixon's reactions to key events, as well as the way he would solicit reactions from his staff to his speeches, shows him at his most conniving and weaselly - it at the very least casts him in a much more human light. 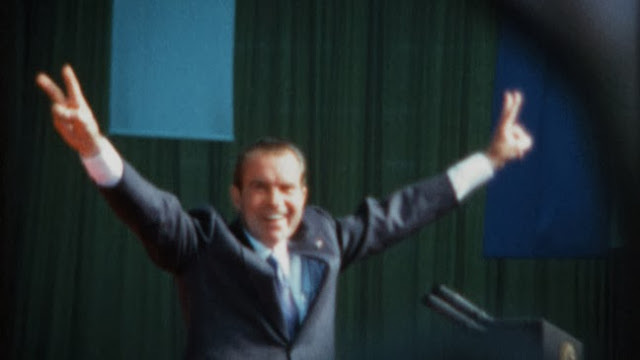 The main point of interest in the film lies in the way it illuminates Nixon's thought processes and how he dealt with those around him, rather than the previously unseen footage of him. Lane follows a fairly linear path, hitting all of the major bullet points of Nixon's presidency - his crackdown on campus protests, his outreach to China, the end of the Vietnam War and the early rumblings of Watergate - and it's fascinating hearing how these played out within the confines of the White House from the mouths of the men involved. Though it's mainly concerned with the big picture stuff of foreign and domestic policy, the most interesting material tends to be more personal, such as Nixon's insistence that Henry Kissinger not be sat next to glamourous women at Washington functions because he felt that Kissinger's 'swinging' lifestyle would play badly in the Beltway, even if he was happy for him to do it in New York or Florida. It's small details like this which are ultimately more illuminating, though there are regrettably few of them present in the documentary. Other than its footage, there isn't much startlingly new in Our Nixon, but it does assemble a lot of the existing material in an interesting and engaging way, one which breathes life into a story that has been told and retold so many times before. Anyone who has much prior knowledge about Nixon and his presidency is unlikely to come away having learned anything new, but it's a very well assembled and perfectly good primer on the period, one that grasps the complexity of its central figure, even if it doesn't do much to really explore him.